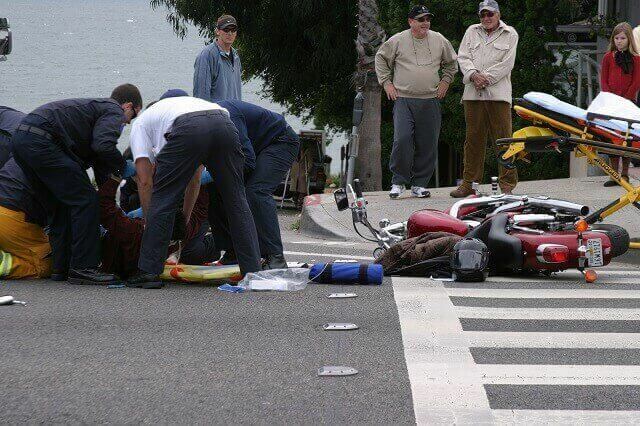 Why Are Motorcycle Accidents so Catastrophic? Motorcycles, unlike motor vehicles, are unprotected from their surroundings. That means when a rider is involved in an accident, they could be hit by debris, asphalt, and even vehicles. Being so vulnerable puts a rider at high risk for catastrophic injuries – some of which could be fatal. Therefore, it is no surprise that motorcycle accidents result in catastrophic injury claims and higher settlements than average motor vehicle accidents. If you were injured in a motorcycle accident, it is in your best interest to speak with an accident attorney. An attorney can assess the circumstances of your accident and not only determine if you have a valid claim, but aggressively fight for your right to compensation. Motorcycles are not as stable and lack the visibility of your average passenger car, but they still have high performance capacity. Therefore, they can move quicker and zoom in and out of traffic with ease. While they have that mobility, the mobility is often what hurts the rider. After all, to provide such performance capacity, the rider must be fully exposed to the elements. They do not have the protections of a passenger vehicle, including airbags, crash absorption systems, and so forth. The full force of the impact is placed on the rider’s body. According to the Insurance Institute for Highway Safety (IIHS) Highway Loss Data Institute, the government estimates that for every one mile traveled in 2015, the number of deaths for riders was 29 times higher than the number for passenger vehicles. The average engine size of the motorcycle riders killed was larger than a 1,400 CC. One of the most common and devastating injuries in a motorcycle accident is head trauma. When a traumatic brain injury occurs, it can be devastating and lead to long-term complications. For some, it could lead to death. You can see that a clear majority of riders still died from their injuries despite wearing a helmet. However, not wearing a helmet increases the risk of death in a minor motorcycle accident substantially. Therefore, all riders and passengers on motorcycles should still wear the proper helmet to increase their chances of surviving a crash. While lower extremity injuries are also common, the most common fatal injuries occur to the head, according to the National Highway Traffic Safety Administration (NHTSA). A catastrophic injury does not have to be fatal. In fact, many devastating injuries are not fatal, but leave the victim with long-term disabilities. Lower extremity injuries are the most common seen by Level I and Level II trauma centers nationwide. An estimated 97 percent of those injuries were AIS 2 or higher, and a vast majority involved bone fractures and soft tissue damage. Luckily, an estimated 81 percent of patients who sustained lower extremity injuries were eventually discharged from the hospital, but the cost of those injuries ranged anywhere from $20,745 in hospital charges to as high as $56,288 per patient. These charges only reflect the immediate care after the accident, and do not even address the long-term care or other financial losses that victims sustain. Motorcycle accidents are highly complex and involve the interaction of a motorcycle, environmental factors, vehicles, and the person riding the bike. There is no such thing as a “typical” motorcycle accident. In most cases, these accidents are violent events that result in death or disability. An ejection from the motorcycle is a common pathway to injury or fatality, because when the bike comes to a sudden stop, there is nothing affixing the rider to the bike. Also, the rider can forcibly strike any objects within the pathway of the ejection – as well as the ground. Think of your passenger vehicle, then consider a motorcycle. A motorcycle does not have the same protection or crashworthiness. Vehicles weigh considerably more and have more bulk. They also contain door beams, roofs, airbags, and seatbelts – things that a motorcycle does not have. They are stable, because they have four wheels on the ground, while a bike has two. When a motorcycle sacrifices weight and bulk, it receives agility and maneuverability. A skilled rider can also swerve quickly, when necessary. However, in an accident situation that they cannot escape, those protections that bikes lack are glaringly obvious. Motorcycle accidents occur for a variety of reasons, but one of the more common is a lack of control or understanding. A rider may not be able to appreciate the characteristics or limitations of their motorcycle; thus, causing their own accident. Other times, multi-vehicle crashes are the cause. For example, a common reason for motorcycle versus passenger vehicle accidents is that a motorcycle is caught by a vehicle turning into its path during a left hand turn. Also, a good majority of motorcycle accidents involve alcohol, whether the rider, or the driver of the other vehicle was intoxicated. Riding a motorcycle while impaired is especially dangerous, because it affects a rider’s reaction times and ability to stay balanced. While head and chest injuries are the most common reason for motorcycle fatalities, you must realize that helmets are still the single most important safety device. A helmet has a large, durable outer shell that can distribute the force of an accident away from the skull and protects it from being pierced. The inner liner is crushable and limits force by absorbing a portion of that impact. When a helmet works, it can save a victim from a lifetime of traumatic brain injury consequences. Federal safety standards are in place for motorcycle riders and the helmets they wear. Therefore, riders should only purchase motorcycle helmets that have been federally approved. Older models often do not meet these safety standards, and they can even obstruct a rider’s view – thereby actually causing an accident. Crashes that involve a motorcycle and passenger vehicle striking from the front are often deadlier than any other type of vehicle incident. That is because it forces the motorcycle to come to a sudden stop, which ejects the rider into the other vehicle, over the vehicle, or into standing objects. At high speeds, rarely will a rider survive a head-on collision with another motor vehicle. Vehicles are closer to the rider than they would be sharing the same lane. There is reduced space between vehicles for the rider to maneuver and swerve to avoid an accident. Cars do not anticipate that a vehicle or rider would be passing them in stopped traffic; therefore, they rarely look for riders. Sometimes in a lane splitting accident the rider is at-fault, while other times the motorist could be at fault. It depends on the cause of the accident, and the laws of the state – whether lane splitting is allowed in that state or not. Who Pays for the Catastrophic Accidents? In a serious motorcycle accident, the at-fault party will typically pay for damages. Sadly, there are incidents where the passenger vehicle takes off or does not even realize they caused an accident. For example, when it is dark, and a motorcycle is attempting to pass a vehicle. The driver of the vehicle tries to change lanes, but doesn’t check their blind spot before doing so. The rider sees the vehicle and tries to swerve out of the way to avoid the collision, but crashes on the side of the road as a result. The driver never noticed the rider; therefore, does not realize they ran them off the road. In this case, the motorist continues to drive away. In instances where the driver leaves the scene, the rider’s uninsured or underinsured motorist coverage may pay for the injuries until the driver of the at-fault vehicle can be found. Regardless, catastrophic injuries may exceed a person’s insurance coverage, especially if that motorist has the minimum liability insurance coverage. While insurance is only obligated to pay up to the policy maximum, there are other ways that a victim can recover fully. If you have suffered a serious accident because of a careless motorist, you have the right to compensation for your injuries. To explore your options, you need to speak with an attorney that has experience handling the complexity of a motorcycle accident case. Speak with an attorney from Malman Law today to get started. Schedule your free consultation 24 hours per day, seven days per week at 888-247-2160 or request more information online.